This is a beautiful area that I have never been to. Always heard about it and it was reported to be the "New Canaan" of Central CT, but frankly, I think its prettier. Something about the antiquity of the area and the care that the townspeople have put into maintaining their communities says alot more. I guess Tobacco, Guns and Insurance does more for the community than Wall Street, kind of ironic when you think about it. Penwood State Park is the farthest north I have ridden in CT and its quite beautiful. 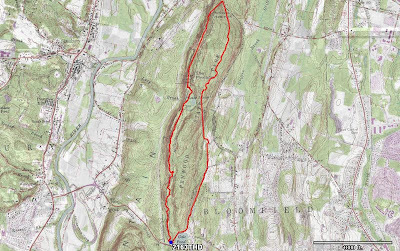 In fact, if you look at the big map on Crankfire, you'll see the only other riding area even further north in the state is Soapstone State Forest. The ridge trail runs along a cliff that rose 200+ feet above the Farmington River Valley. Above is the track file from GPS Visualizer. 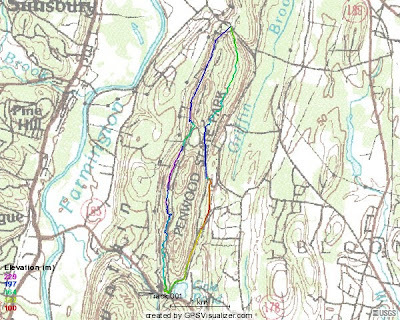 Below is my track file that I uploaded to Singletracks, and if you want yet another comparisson of what it looks like, check out the map of a few rides on Crankfire.com, which will give you a better perspective of the whole trail network. It was a hazy and hot 91 degrees but I must have drank 2 liters of water on the ride up there so I was pretty well hydrated. This was our NEMBA Board meeting but there were only three Board Members there, Art, Glenn, and myself. Our Executive Director was supposed to pay us a visit from Acton, Mass, but bailed because he didn't think we would have enough members there - I had no idea who was coming at that point when PK called to say he didn't think it would be worth driving all that way and there was no one to talk to. However, we had quite a turn out. Not including the board members, there were nine other riders who showed up, plus four more riders from Berlin Bikes who joined our ride as we took off. First time for me on the Fixation after switching back to the nine-speed cassette that I can still only get 8 gears out of. Bike handled really well but it was still hard getting used to remembering when to be in the right gear. Riding a single speed is so much more simpler. The big volume tires that I am running certainly helped though. Penwood is very similar to West Hartford Reservoir in terms of technical trails. Art had a flat and since I was one of the weakest riders in the group he and Glenn stayed with me and this other guy, who was alot older than me riding a new KHS rig. We lost the pack of guys that we started out with and decided to head back once we got to the top of the park. Apparently, there are more trails that go to the end of the ridge. Coming back started out with some double track that eventually turned into some nice single track, but it was a grueling climb back up the ridge. Once we got back on the ridge, we picked up an old paved road and road that down to a park. From there it was back to more double track along some nice homes, again very similar to West Hartford Reservoir and then back to the parking lot. After some idle chit-chat in the parking lot and waiting for everyone else to return, we all headed over to Simsbury for dinner. We ended up having pizza and my favorite Berkshire Brewing Company beer for dinner. Short meeting afterwards and it looks like we may have some others interested in getting more involved with the chapter. WOW! This is one of my old haunts! Cool. I'm working on a project right now to get every trail in the US on a free database. I know there's other solutions out there, but I like my little project and could use some help with it. As a current resident of Utah I've got the skeletons up for a lot of trails here, not a whole lot for CT yet, but that will eventually change.